We are located in the gently rolling hills of southern Wisconsin. Our pastures lay in the shelter of a steep hill that was once known as the location of a homemade astronomical observatory, a telescope placed in an old grain silo. Nowadays our sheep enjoy the nighttime views of stars, planets, and the Northern Lights. By day, they graze on pastures of grasses and clover, and are happy to accept a scratch on the head from their devoted shepherds. We raise natural colored and white fine-fibered Corriedale sheep. Our sheep wear jackets year-round to keep their fleeces clean, because it’s no fun to pick “stuff” from a fleece when you’d rather spend your time transforming the fiber into art. The wool of our sheep is among the finest, softest wool available from purebred natural colored Corriedales. In addition to its lovely soft handle, it comes in beautiful shades of natural grays, browns and black, and of course white. 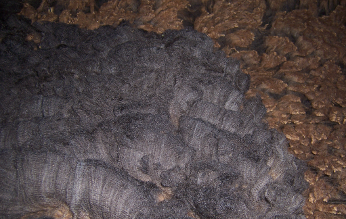 We skirt our raw fleeces heavily to make sure you get only the best part of the wool. We love our sheep and their wool, and we think you’ll love it too once you feel its plush softness yourself.